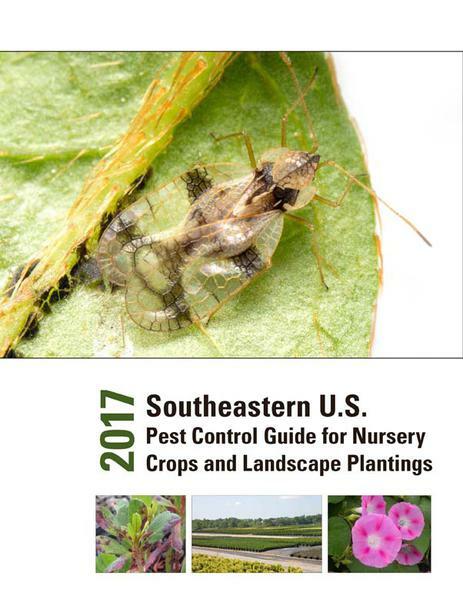 This pest control guide was a project of the Southern Nursery IPM Working Group (SNIPM) and collaborators. In it, you will find up to date information about pest control products used in nursery crops, greenhouse crops and ornamental landscape plantings. This publication supplements the more comprehensive integrated pest management (IPM) manuals for trees and shrubs available for download from the SNIPM web site, The information provided in this publication is, as much as possible, up to date at the time of publication. However, product registrations can differ between states and labels can change. Thus, this information is intended as a guide to aid in pest control decision-making and not a substitute for reading and following the directions and guidelines on the pesticide label. 2017 Pest Control Guide cover photo. Contribution Universities and Extension Programs. Recommendations for the use of agricultural chemicals are included in this publication as a convenience to the reader. The use of brand names and any mention or listing of commercial products in this publication does not imply endorsement by SNIPM, the authors, or their respective universities, nor discrimination against similar products not mentioned. Individuals who use agricultural chemicals are responsible for ensuring that the intended use complies with current regulations and conforms to the product label. Recommendations of specific chemicals are based on information on the manufacturer’s label and performance in a limited number of trials. Because environmental conditions and methods of application by growers may vary widely, performance of the chemical will not always conform to the safety and pest control standards indicated by experimental data.